School Lunch Messages with Bananas! Show a little extra love to your kids and family today. 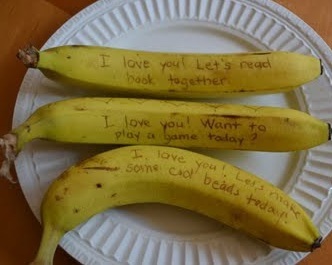 Make your kid’s lunch noteworthy & fun by writing a message on your kid’s banana or orange! They will have a nice surprise in there lunch. Or make sweet notes and comments on the bananas and oranges that sit out on the cabinet and each time a person grabs one to eat they will have a nice sweet and encouraging message from you. I use a marker to write the messages, but I found the cutest way to write on the banana using NO markers -just a toothpick. See that idea here. Have you left banana messages before?